I just wanted to share an inspiring ad with you today. If you have seen it—watch it again! If you haven’t seen it–enjoy!! Cheers to a better day…TODAY!! I think we can all strive to live this motto…BEST YOURSELF!! Make a difference in the world, make your mark, become better every day and be your BEST!! Step out of your comfort and try something new. Go online & try something new from a youtube video. Make a movie, learn to do design, make a beaded necklace, learn to play the guitar, speak a foreign language, etc. There is sooo much to learn & the internet is an amazing resource. Wear something bold…my daughter put on a shirt this morning that was black and white zebra stripes with a sequin shrug, followed by hot pink pants. She looked at me, put out her hands like claws and said, “I am fierce.” I smiled & was so proud of her!! She was stepping out & not caring what anyone else thought & that was a huge step for her because usually she cares too much about what others think. You go girl!! Get Creative. Try the daily creativity activity. Do something–anything that is creative each day. Write, draw, journal, take a picture, search for creative ideas, etc. Get out of yourself. Do something nice for someone else, Serve, Write a kind note, Give encouragement, volunteer, etc. Do something for you. You cannot be your best self while giving EVERYTHING to everyone else. Do something that will energize you or light you up…exercise, do yoga, meditate, get a massage, buy yourself a new music album, get a facial, take a nap, go on a walk, buy yourself a bouquet of flowers, etc. Be kind…to others AND especially yourself. Don’t allow negative mind chatter and negative self-talk continue. Begin to take control of the things you are saying and thinking to yourself. You would be amazed at the cruel things you believe about yourself & it is because you continue to allow your mind to run wild with cruelty & not kindness. Begin to envision your mind like a television station with one show that has kind, loving people telling you nice things & another with mean, grumpy people sharing rude remarks. Who do you want to watch?? hopefully, the nice station, so when the rude station is trying to catch your attention make it a conscious decision to switch the channels & fill your mind with kind words rather than negative ones. Surround yourself with great people. Put yourself in the arms of people who lift and build you. Who love and care about you unconditionally. 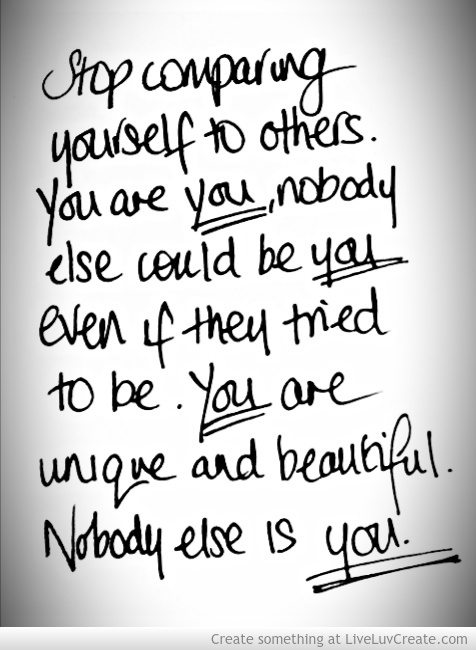 Remember this…You are the one and only YOU. You are AMAZING. You have gifts only YOU can offer the world. Be true to you.